In Part 1, I explained the back story behind the search for Japanese editions of Starrett's The Private Life of Sherlock Holmes. Here are the results of that search. I am tempted to say this is the complete history of Private Life in Japanese, but I’ve been burned too many times in the past to be confident of such a claim. Just when I think I know something definitive about Vincent Starrett, some new tidbit comes to light and I realize I’m still several puzzle pieces short of the full picture. Let’s just say you will know everything I have on the subject. If any of you know more, please get in touch. I would love to learn about other bits and pieces of Starrett's work that has been translated into Japanese. The cover of the Japanese edition of Ellery Queen's Mystery Magazine for January 1981, issue No. 19. The fantastical Art Deco locomotive is reminiscent of The Twentieth Century Limited. Oh, there is just one more caveat, and it’s a HUGE one: I don’t read Japanese. So while I can describe a few things about these publications and make some reliable guesses about other points, I really can't comment in detail. Mitch Higurashi’s greatly helpful information (see Part 1) is cited whenever possible. Where Mitch’s name is not used, you’re reading my best guesswork. I try to make it clear which is which. If you find an error here, it's mine and not Mitch's. 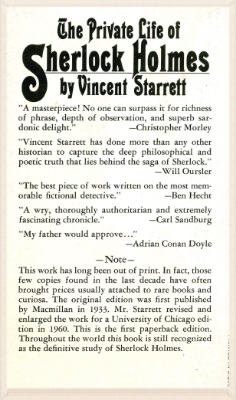 The opening spread for the January 1981 issue showing Arthur Conan Doyle. I think it's the chapter Starrett called "The Real Sherlock Holmes." EQMM was published every other month in Japan at the time. The Private Life chapters were translated Tsukasa by Kobayashi and Akane Higashiyama were published from March 1980 to May 1981, according to Mitch Higurashi. The chapters were in the Japanese EQMM issues for March, May, July, September, November of 1980 (whole number issues 14-18) and January, March and May of 1981 (whole number issues 19-21). The cover and first spread of the 1981 issue of the Japanese EQMM is above. The dust jacket cover for the 1987 Japanese edition of The Private Life of Sherlock Holmes. Photos and illustrations not in the original edition were prepared by the translators. There is also a translator’s afterword by Tsukasa Kobayashi and Akane Higashiyama on pp. 364-366. Observation by your correspondent, not Mitch: The relationship between this edition and the Pinnacle edition goes beyond the text. Take a look at the style of the title that’s used on both the dustjacket cover and the book’s cover, shown above. The back cover of the Pinnacle edition of Private Life. Compare this with the image of the Japanese dust jacket above. Now compare this with the back cover of the Pinnacle edition seen at left. The type style is very similar, as you can see. Speaking of the book's dust jacket, take a look at the bas relief of Holmes just under the title. It is a reproduction of the plaque erected at the Reichenbach Falls in 1957 by the Norwegian Explorers of Minnesota and the Sherlock Holmes Society of London. I wonder if they ever thought that their plaque would be on the cover of Starrett’s masterpiece in Japan some 30 years later? The cover of the 1992 paperback edition of The Private Life of Sherlock Holmes in Japanese. Unlike the hardback, this is a translation of the 1933 original edition and carries a copyright notice of 1933 by Vincent Starrett. There is also a translator’s afterword by Tsukasa Kobayashi and Akane Higashiyama on pp. 318-321. Observation by your correspondent, not Mitch: The cover illustration contains the outline of Holmes from the plaque at the Reichenbach Falls. I can’t guess what the background illustration might be.